One end has a USB Micro-B right-angle connector. This enables the cable to be easily routed toward the back of Pulse and Dart cameras. The other end has a standard USB Type-A connector. 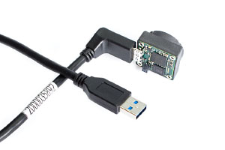 Recommended for use with USB3 Vision cameras that do not require a screw-lock type connector. Great for laboratory environment.